I have a confession to make: I am absolutely passionate about great design! I’ve been fascinated by design for as long as I can remember. 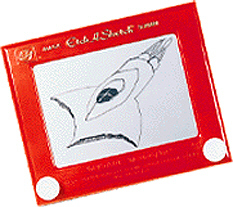 As a small child, I would play for hours on end with Lincoln Logs, Lego's, and—my first real laptop: an Etch-a-sketch. I would build and draw everything you could imagine. I started drawing cars when I was in third grade. 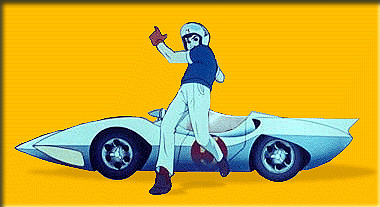 Speed Racer's Mach 5 was my favorite car to draw. I must have drawn his car a million times. I believe design is the supreme art. This is because all decisions we make, are—or should be—by design. Design is the foundation of everything. Even when we imporvise or decide not to make a decision, it is by design. When an artist paints a canvas, it is by design; when a ballerina performs, it is by design; when a ballplayer swings a bat, he swings it a certain way—all by design. World renowned graphic designer, Saul Bass succinctly illustrated this axiom when he said, "Design is thinking made visual." David Kelly of IDEO further illustrates this by saying, "The only thing that's not designed by us is nature. Everything else is designed." Design is a form of self-expression. It is the intersection of art and science, and should always be about the pursuit of excellence. Excellence by definition is the ideal form of anything. God gave us eyes so we could appreciate beauty. Great design—like art—is beautiful, intriguing, and timeless. Whenever I design a product, I always try to make it timeless. 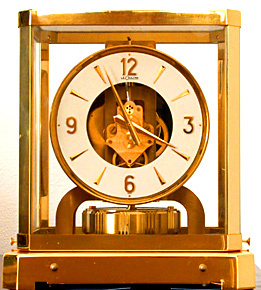 Timeless Design, by definition is when a product looks like it is simultaneously from the past and the future. Timeless design incorporates the most valuable, and thus, precious form. 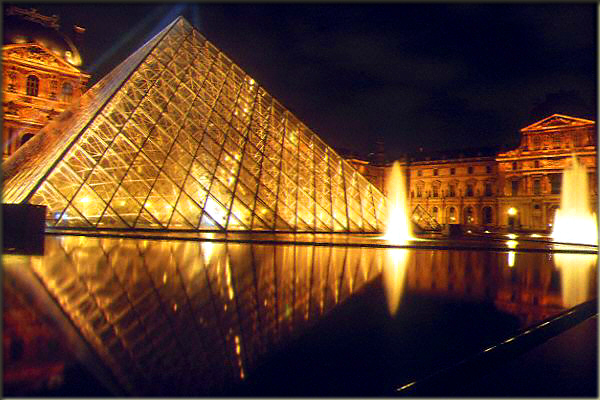 It is based upon enduring universal principles coupled with imagination, innovation and flair. 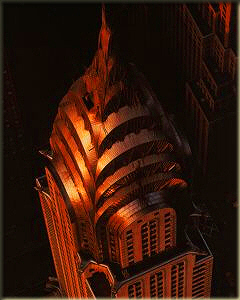 The Golden Gate Bridge and the Chrysler building are excellent examples of timeless design. The criteria in determining the value of a design is the same as a piece of real estate. It is based upon the principle of highest and best use. Design is part art, and science. A design scientist would tell you that design is 51% science (objective) and 49% art (subjective). An artist would argue the opposite. Form versus function; utility versus aesthetic. As a designer (and Libra) I believe that ideally you want a perfect 50-50 balance. My design influences run far and wide. 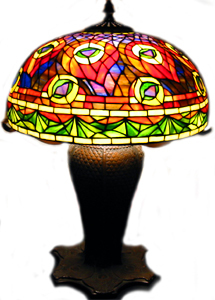 I have a great appreciation for Art Nouveau (1890-1914) which includes products like Tiffany lamps. The Art Nouveau movement came directly after the Arts and Crafts movement and emphasized organic lines as found in nature. 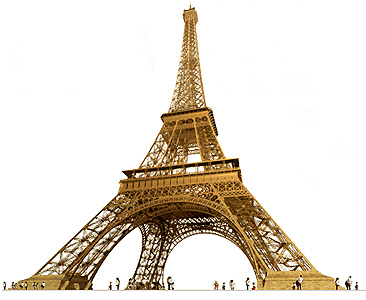 The Eiffel Tower was built for the Universal Exhibition in celebration of the French revolution. The World Fair (Exposition Universelle) held in Paris (1900) brought Art Nouveau to the center stage as a new style in design and architecture. Over fifty million people attended the fair which included new styles of metalwork, glass, textiles, jewelry, furniture, ceramics, architecture and posters. Also the extreme beauty of the Bust of Queen Nefertiti. Circa 1372 B.C. 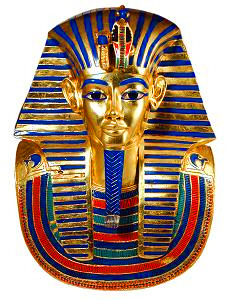 During the 18th Dynasty (3400 Years old). 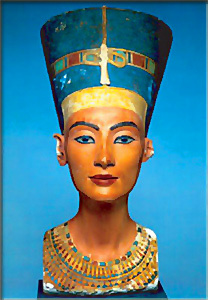 The Queen Nefertiti Bust was obtained by the Egyptian Museum in the Berlin Museum in Germany in 1912. When I was seventeen, I wanted to be an automotive engineer, but realized that my talent would go to waste. Keep in mind this was during the era that replaced the Ford Pinto with cars like the Chrysler Reliant K. Car design was great in the 1950s but lost it in the 60s. Great car design is back! The best example I know of for automotive design excellence is the Ferrari Modena 360 Spyder as seen below. The Spyder was designed by the legendary Italian firm, Pininfarina. Pinin Farina said, "I perceive my work as moving sculpture." 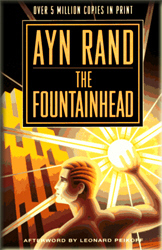 When it comes to literature, my favorite book that has had a superb influence on me is Ayn Rand's, The Fountainhead. Her character, Architect Howard Roark in particular is fascinating. I came across the book when a woman I met told me that I reminded her very much of the Howard Roark character in the Fountainhead. 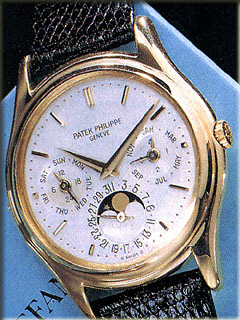 I have had a fascination with watches since I was sixteen. 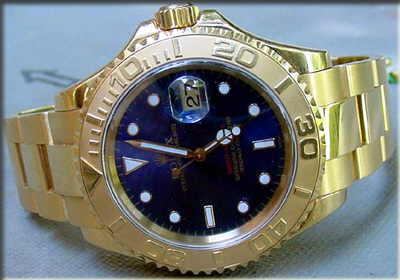 There are not many ways a man can distinguish himself accessory wise, but wristwatches are one of them. 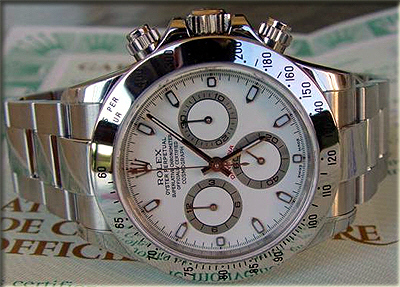 I have always liked Rolex's Oyster Perpetual sports watches. 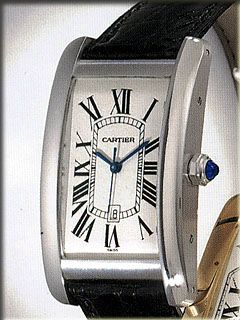 Patek Philippe and Cartier are also favorites of mine. My father Jake Jr., and my grandfather Jake Sr., were both a great source of inspiration. They both had a great sense of style. My grandfather Jake, was extremely dapper and my dad was very elegant. Growing up, I developed a deep appreciation for the Old Hollywood of the 1950s and early 1960s. In particular, I loved watching old Cary Grant Movies. Cary Grant in many ways was the living embodiment of elegant masculinity and humor. In my opinion, Cary Grant was the real James Bond. I was also crazy about Sophia Loren. Sophia in many ways is my idea of the ultimate woman. It is interesting to note that Cary and Sophia had an affair and were almost married. Other actors from old Hollywood that had an influence on me include Grace Kelly, Humphrey Bogart and Lauren Bacall, and last but not least Marylyn Monroe. In clothing design, my two greatest influences are Coco Chanel and Ralph Lauren. Coco reinvented femininity for the 20th Century, and Ralph rejuvenated American style and quality. When it comes to politicians whose personal style influenced my, there is JFK and Ronald Reagan. JFK with his classic preppie style and Regan with his old Hollywood vibe. 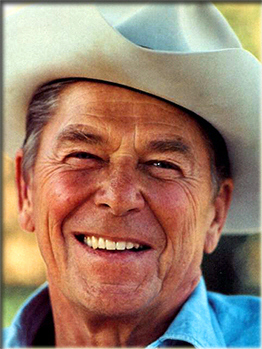 Ronald Reagan was an old friend of my grandparents. 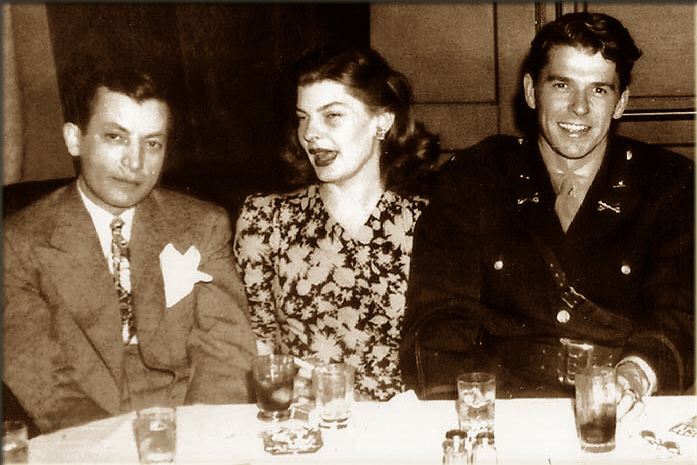 The picture below is of my grandfather Jake Ehrlich Sr., and my grandmother Evelyn with Ronal Reagan in 1943. By the way, Reagan was a Democrat in this picture. 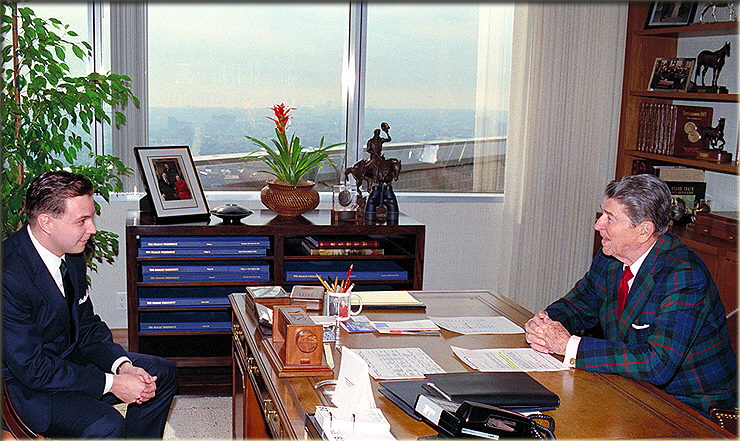 I was fortunate to have the opportunity to talk with the Gipper about his wardrobe and his sense of style. He shared many ideas with me about his clothing philosophy. He told me about his tailor, Frank Mariani who's father had first outfitted Reagan in the late thirties. 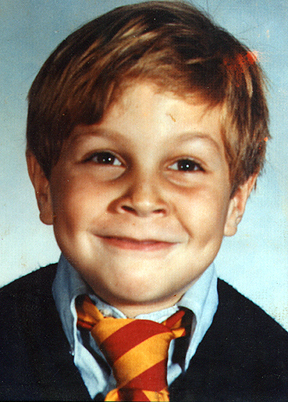 I had the opportunity to review Reagan's suit pattern that had been modified since 1938. I examined his pattern because I wanted to figure out what design elements gave him so much presence when he wore a suit. I noticed that when Reagan became the president in the early 1980s that his suits look strikingly different from the funky 1970s influenced suits that all other men were wearing. After careful research I realized this was due to the fact that his suit pattern was from the late 1930s and had been simply graded up as he slowly gained weight over the decades. Up until the mid 1960s suits were V framed in shape, and beginning is the late seventies, men's suits became A framed in shape. I love color! 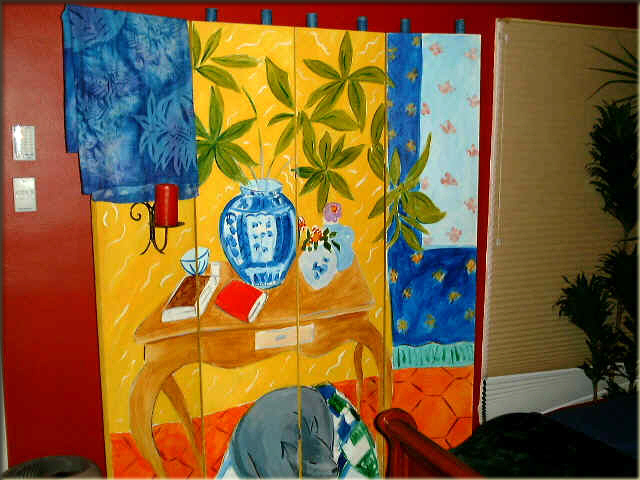 I believe that color has deep psychological effects on people. My home is filled with many different colors. The colors of the rainbow to me are a form of Color Therapy that—like music—sooth, inspire, and rejuvenate the soul. The picture below is of my bedroom. The painting above my bed is Vargas. Alberto Vargas' work has also been a great source of inspiration for me over the years. 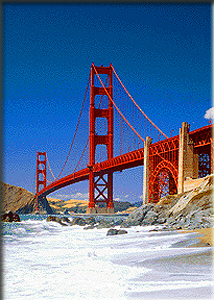 Having been born and raised in San Francisco, it is difficult to find places that are more geographically colorful or beautiful. Once such place that has been a source of inspiration for me is Bora Bora in the Tahitian islands. Author James Michener referred to Bora Bora as The most beautiful island in the world. I have never seen such a beautiful palette of colors in my life as the sunsets and the water of Tahiti. If you carefully study the people whose ideas have marked the upward surge of mankind you will notice certain recurring patterns. When I suggest that design is the supreme art, it begs the question of what constitutes art? 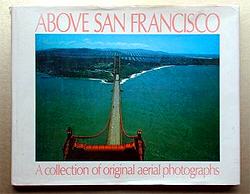 I once had a conversation with Robert Cameron, the famous aerial photographer. Cameron was a aerial surveillance photographer for the U.S. Military during World War II. 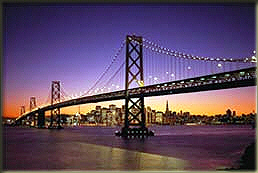 He is most famous for his Above books, which include, Above San Francisco, Above Paris, and Above New York. I was having a fascinating conversation with the old boy (he was 89 years young at the time) about photography as an art form. 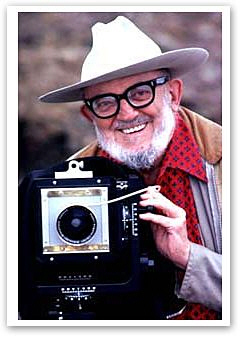 He told me about an argument he had in 1970 with his contemporary and close friend, Ansel Adams. They were arguing about whether photography was an art form or not. Robert was arguing it was not. 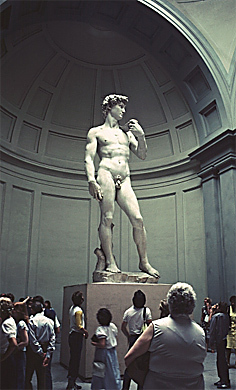 Adams quickly changed Cameron's mind when he responded, "Photography is the greatest invention for recording and communicating, but if someone receives an emotional response from one of my images, then to him it is an art form." This insight is interesting because it was between two of the greatest photographers in history. 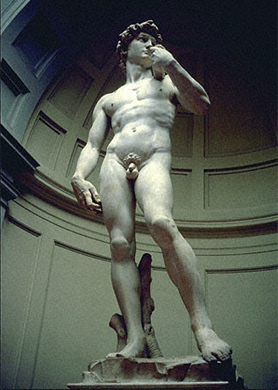 It is particularly fascinating, in the sense that it clearly defines art as being a form of self expression that people have an emotional response to. The thing that makes design the supreme art, is that when you set out to design something, you ultimately want the product to serve its purpose, but at the same time you want people to not only have a positive emotional response to it, but ideally you want them to find it to be very interesting or even love it. Best-selling author, Steven Covey wrote a profound book named The 7 Habits of Highly Effective People. One of the 7 habits is “Begin with the end in mind.” Because design is typically about solving problems or overcoming challenges, it is important to begin by clearly identifying the cause of the challenge so that you may come up with a great solution. By starting with the end in mind you can build a solid foundation. Keep in mind that if the foundation is weak, the rest of the structure will be affected accordingly. So the first rule of great design is to always begin with the end in mind. All visual design may be reduced to 7 elements, factors, or dimensions. 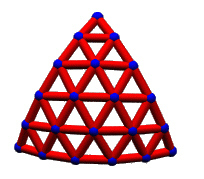 These elements are the building blocks of art structure. They are the alphabet or scale of graphic expression. When an artist organizes these elements he creates form, which is design or composition. 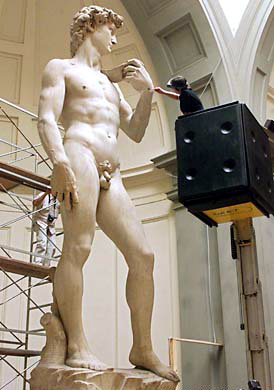 Art is man-made order, that is, structure or form. 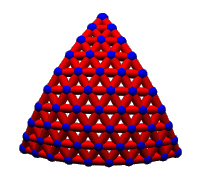 These seven elements are the materials from which all designs are built and consist of : 1. Line, 2. Direction, 3. Shape, 4. Size, 5. Texture, 6. Value, and, 7. Color. The principles of design, are the principles by which the elements of design are related or organized include: 1. Repetition, 2. Alteration, 3. Harmony, 4. Gradation, 5. Contrast, Opposition, or Conflict, 6. Unity, and 7. Balance. Artist, Umberto Ruiz said, "Design is evolution." Great design is typically the result of imagination, innovation, profound thought and persistence. 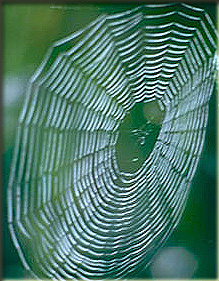 We live in a Universe that is interconnected in a seamless but typically invisible web. In one way or another everything is derivative; everything is connected—by degrees of separation. Pablo Picasso profoundly illustrated this when he said, "Good artists copy. Great artists steal." 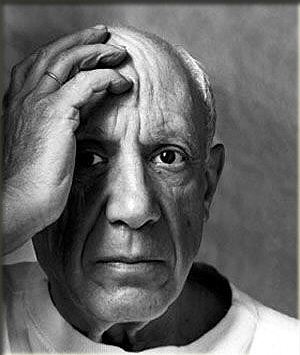 Picasso also said "I am always doing that which I cannot do, in order that I may learn how to do it. 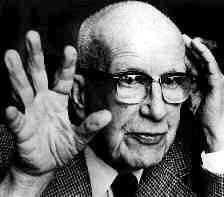 Charles Kettering said, "An inventor fails 999 times, and if he succeeds once, he's in. He treats his failures simply as practice shots. Design to a large extent is a perception game, and the one thing we know for certain is that perception is reality. At the end of the day however, design is about creating things that function properly and serve a specific purpose. Carlos Jiminez, architect and professor of architecture at Rice University confirms, "One could define design as the necessary means by which to search for and to implement on optimum solution to a problem. 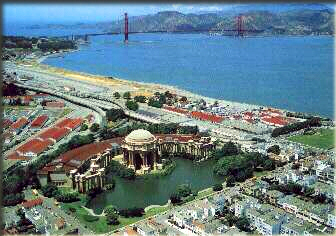 A solution which merges beauty, intelligence, and need. This is why we love well-designed objects or spaces—They fill us with the vastness of their sensual generosity." Louis Sullivan taught us that “form must follow function,” and the Bauhaus taught us that “less is more.” Einstein, instead of using form and function, used Art and Science. Symbolism and substance—two sides of the same coin. Thomas Edison was the greatest designer of all time. 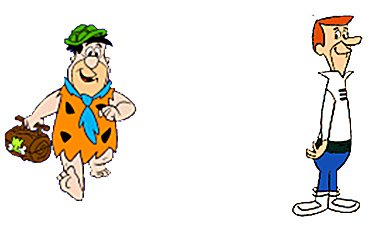 During his eighty four years of life he patented 1093 inventions. Some may say he was an inventor, but at the end of the day, there is no difference between a designer and an inventor. 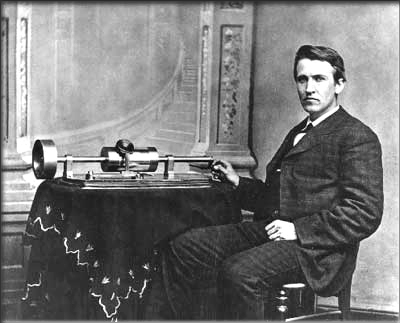 Thomas Edison, among other things, invented, the light bulb; the phonograph; motion pictures; the battery, the typewriter, and the stock tickertape. He then wired the first city on earth for electricity—New York—and created what has evolved into the largest and most successful company on earth—General Electric. Edison said, "Of all my inventions, I liked the phonograph best.... Life's most soothing things are sweet music and a child's goodnight." 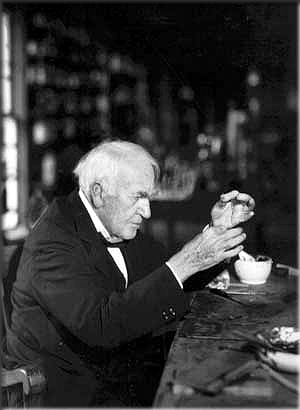 I have always been inspired by Thomas Edison's career. As a designer I live by his philosophy which was simple. He said, "There is a way to do it better—find it." 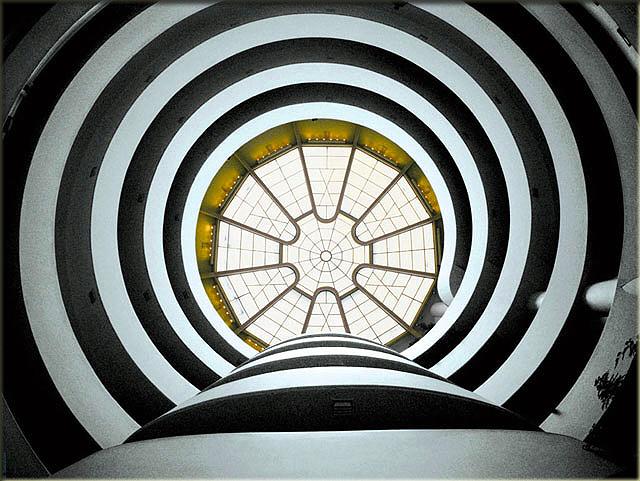 Frank Lloyd Wright taught us about the significance of creating “Order out of Chaos.” Great design is about separating fact from fiction and at the same time, capturing essence. Typically the nature of a design is communicated by its essence or silhouette. Wright probably understood essence and silhouette better than anyone else. Wright said, "God is the great mysterious motivator of what we call nature, and it has been said often by philosophers, that nature is the will of God—and, I prefer to say that nature is the only body of God that we shall ever see. If we wish to know the truth concerning anything, we'll find it in the nature of that thing"
On Fallingwater (pictured above) Frank Lloyd Wright said, "Fallingwater is a great blessing—one of the great blessings to be experienced here on earth. I think nothing yet ever equaled the coordination, sympathetic expression of the great principle of repose where forest and stream and rock and all the elements of structure are combined so quietly that really you listen not to any noise whatsoever although the music of the stream is there. 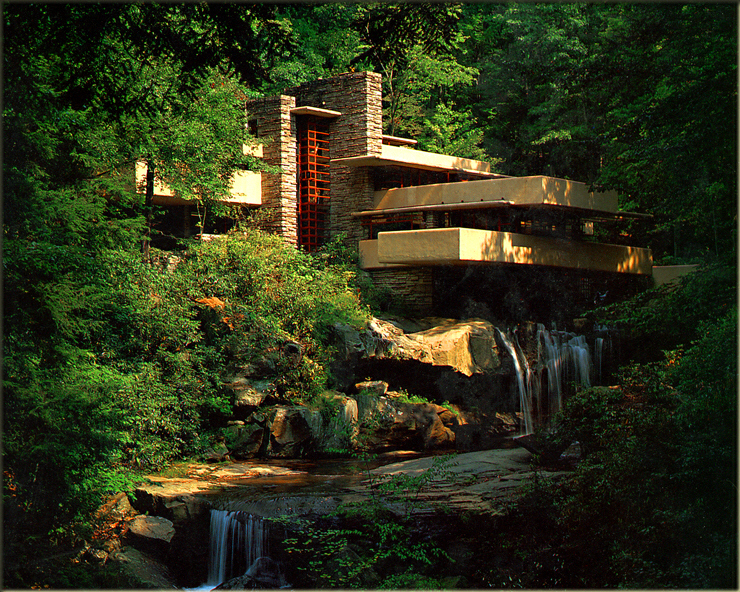 But you listen to Fallingwater the way you listen to the quiet of the country ...."
Wright believed that a building should be organically connected to its environment. He said, "Organic buildings are the strength and lightness of the spiders' spinning, buildings qualified by light, bred by native character to environment, married to the ground." 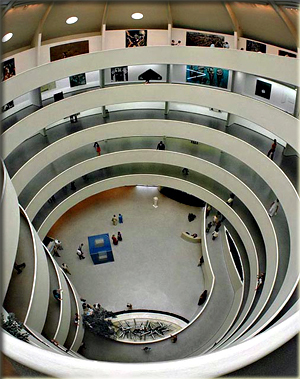 When Frank Lloyd Wright first put forth his design ideas for the Guggenheim Museum (as pictured above and below) in New York many people complained and said it looked like a big washing machine. 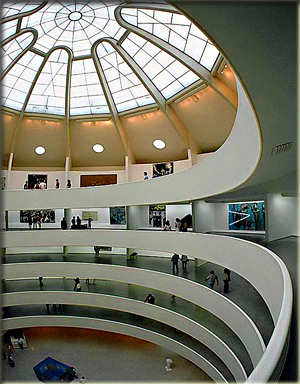 Today, the Guggenheim is considered to be one of the greatest architectural achievements of mankind. 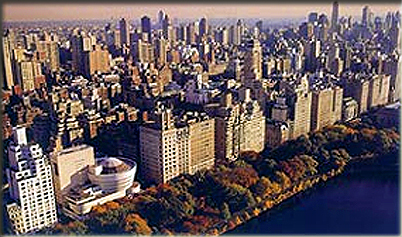 The Guggenheim as seen in the picture above contrasts strongly with the rest of the New York Skyline. 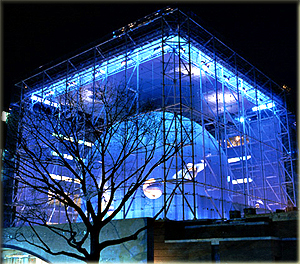 Wright referred to the buildings in New York as being the work of "The glass box boy's." 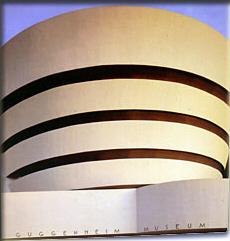 The Guggenheim is a concrete example (no pun intended) of form following function. When you arrive at the museum you take the elevator to the top. Then you walk down the continuous and gentle spiral slope and view the artwork. You always see the art coming up ahead of you, across from you and behind you. 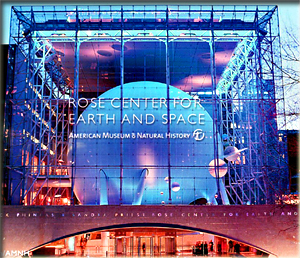 Since we are on the subject of stunningly beautiful and inspirational New York architecture, I must mention the Rose Center for Earth and Space. It is an amazing piece of design work. We Mock What We Don't Understand. Sometimes I feel I have to hate something before I can love it. This may be because, human nature is such that we resist change due to some kind of evolutionary skepticism. It is true that genius is often misunderstood and that the philosophy of one century ends up being the common sense of the next. Great new ideas are often met with tremendous resistance. Less than five hundred years ago, it was believed that the earth was flat and that if you got to the edge you would fall off into the abyss, were there were fire breathing dragons. When Galileo figured out that the earth was round and not flat, the Pope told him to stop telling everybody it was round. The Pope told Galileo that he was freaking everybody out with his concept of a round earth. 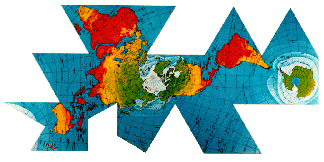 The Pope logically reasoned that if the earth was round, that everybody would slide off. Galileo reasoned that the sun and the moon were both round, and that if you saw a ship come over the horizon that you would see its mast before you would see the bulkhead. The Pope told Galileo that if he kept telling everybody the earth was round that he would have him killed. Galileo kept insisting so the Pope basically killed him. Imagine that. The man considered closest to God killed the man who invented the telescope! 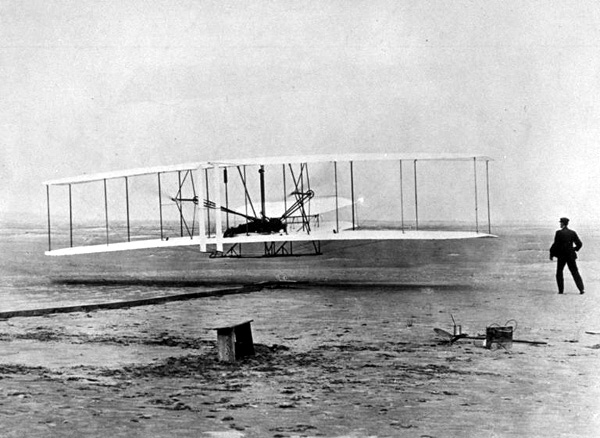 On a chilly morning on December 17, 1903 at 10:35 a.m. Orville Wright changed the commissioners paradigm at Kitty Hawk, North Carolina which resulted in making the world a much smaller place. 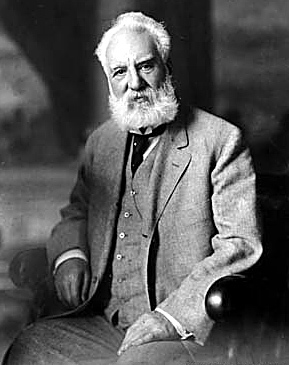 In 1878 Alexander Graham Bell said: "It is conceivable that cables of telephone wires could be laid underground or suspended overhead, communicating with private dwellings...Not only so, but I believe in the future, wires will unite different cities, and a man in one part of the country may communicate.. with another in a distant place." 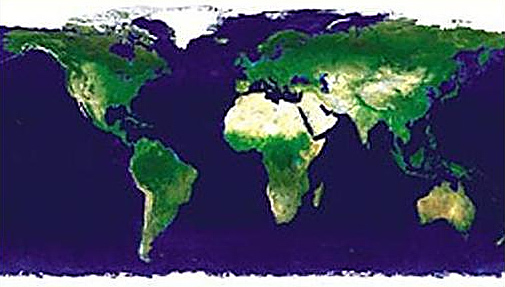 Once again, the world became a much smaller place. Alexander Graham Bell understood the power of deep thought. He said: "Don't keep forever on the public road, going only where others have gone. Leave the beaten track occasionally... You will be certain to find something you have never seen before. Of course, it will be a little thing, but do not ignore it. Follow it up, explore all around it; one discovery will lead to another, and before you know it you will have something worth thinking about to occupy your mind. All really big discoveries are the results of thought." Maintaining an open mind is crucial to achieving great design. 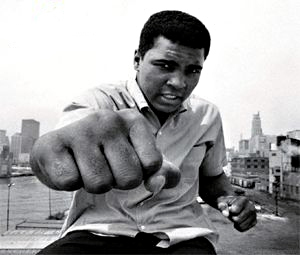 Muhammad Ali said, "The man who views the world at 50 the same as he did at 20 has wasted 30 years of his life." There is a great Chinese proverb that says, "A closed mind is like a closed book; just a block of wood." Thomas Dewa tells us, "Minds are like parachutes-they only function when open." Neil Larson says, "Insight is a shift in boundaries." Design is quickly changing the world! Best-selling Author, Tom Peters points out, "Design is a visceral understanding that is a/the primary way to differentiate a product or service." The way to differentiate is with contrast. Contrast is one of the most important factors in design. A design that contrasts properly stands out. For example, the new VW beetle, which essentially is a circle shape, contrasts with all normal, square cars. 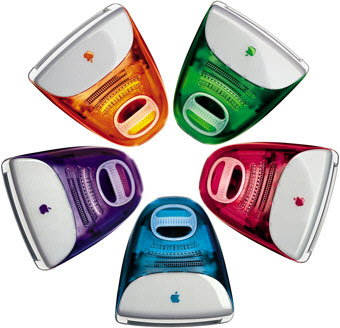 The colorful Apple iMac contrasts in color and shape with all the square beige PC boxes. In a quickly changing world consumers are increasingly hungry for innovative design. Consumers are in pursuit of what is known as the "WOW! Factor." In other words, if you want to be successful with a product, the only acceptable response from consumers' when they first encounter the new product is "WOW!" It is important however to understand that if the product performs reliably, then you have a winning equation. Kevin Roberts, CEO of Satchi & Satchi add agency, puts it best when he said, "The key to developing a successful brand is not to develop a great trademark, but to develop a Lovemark. A Lovemark is based upon developing Lust and Trust in consumers." Roberts pointed out that he bought his teenage daughter a new Volkswagen Beetle and that on occasion he finds her in the garage just staring at it because she thinks it is sooo cool! Roberts said, "If she could think of a way to actually get it in her bedroom, I am certain she would." 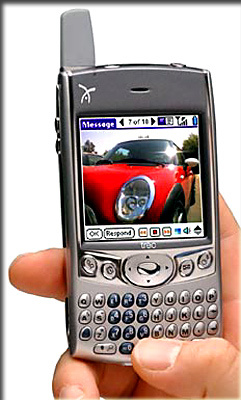 This example of a Lovemark is also illustrated by the success of products like Apple Computer's, iMac, the Palm Pilot and TIVO which help simplify people's lives. As we head further into the information age things are moving at a much faster pace and as a result, cycles occur much faster. Growth is typically exponential in nature. This is clearly illustrated by the fact that more information has been produced in the last 30 years than during the previous 5,000. A current weekday edition of The New York Times contains more information than the average person was likely to come across in a lifetime during 17th-century England. NASA, during the Kennedy administration gave us the “Zero Defects Program,” which ultimately put a man on the moon and resulted in much of the technology we take for granted today. For instance, let's say you're going to a party; you pull out some pocket change and buy a little greeting card that plays "Happy Birthday" when it is opened. After the party, someone tosses the card into the trash, throwing away more computer power than existed in the entire world before 1950. Alexander Graham Bell, the genius who brought us the telephone said, "The most successful men in the end are those whose success is the result of steady accretion... It is the man who carefully advances step by step, with his mind becoming wider and wider—and progressively better able to grasp any theme or situation—persevering in what he knows to be practical, and concentrating his thought upon it, who is bound to succeed in the greatest degree." Johann Wolfgang von Goethe, understood this intrinsically, when he profoundly said, "I respect the man who knows distinctly what he wishes. The greater part of all mischief in the world arises from the fact that men do not sufficiently understand their own aims. 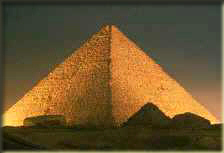 They have undertaken to build a tower, and spend no more labor on the foundation than would be necessary to erect a hut." The power of simplicity is deeply profound! Leonardo da Vinci put it best when he said, "Simplicity is the ultimate sophistication." You’ve undoubtedly heard it before: KISS. (Keep It Simple Stupid) Great design is not only dummy proof, but kindergarten simple (User Friendly). 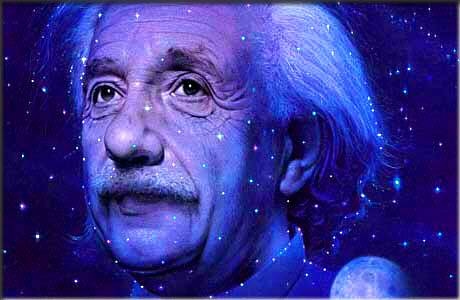 Albert Einstein said, "Everything should be made as simple as possible, but not simpler." Einstein also said, "When the solution is simple, God is answering." In the Mercedes Benz 2000 brochure for their flagship S500 automobile, Mercedes articulately illustrates the power of simplicity: "The face presented to the user is one of intriguing simplicity. It's a rule that has endured since the days of the earliest know designs: The better the technology, the simpler it appears, and the easier it is to use." Mercedes in the twenty-first century is a good example of a company that understands that great modern design can be inspired by the past. Everything considered classic, was once considered modern. As I said earlier in this article, timeless design is the highest form of design. 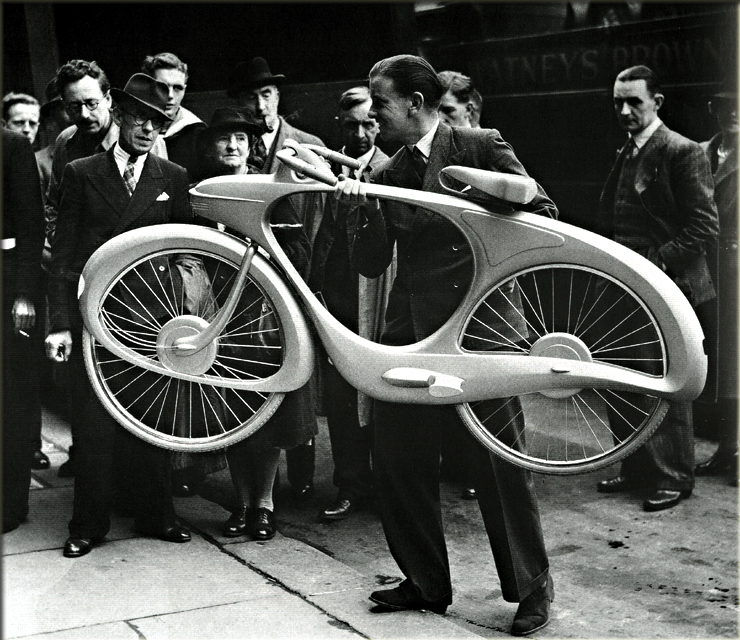 Timeless design, by definition, is when something looks like it is from the past and the future—simultaneously. The most powerful things in life are the simplest. But achieving true simplicity is complicated. 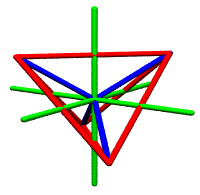 When you look at a Pyramid that was constructed in ancient Egypt, you say “what a simple design.” Then if you try to construct a pyramid you realize that it is quite complicated. Same thing with the way Michael Jordan played basketball. 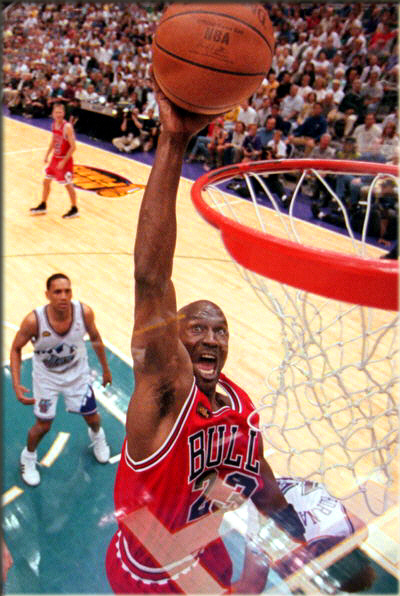 You saw Michael make certain moves and you thought, "how simple" until you got out on a court and tried to duplicate them. That's when you understand how complicated his moves really were. This is one of the supreme paradoxes of simplicity. Jazz musician, Charles Mingus said it best, "Creativity is more than just being different. Anybody can play weird—that's easy. What's hard is to be as simple as Bach. Making the simple complicated is commonplace—making the complicated simple, awesomely simple—that's creativity." 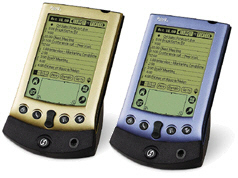 Jeff Hawkins, inventor of the Palm Pilot, stressed, "One of the keys to successful product design, is understanding the importance of a simple user experience. That simplicity can and should stop designers from overloading devices with too many unnecessary features." World renowned designer Phillippe Starck goes so far as to make the point that, "Inventing is probably the only proper profession there is." At the end of the day if a product design is not very useful it has no real social value. If designers create half-baked products it drains society of precious resources. I strongly believe designers have an infinite responsibility to society to bring to life products that will not become obsolete in a short period of time. When a product is well designed it has a long life and benefits society. Design is part science (function) and part form (art). 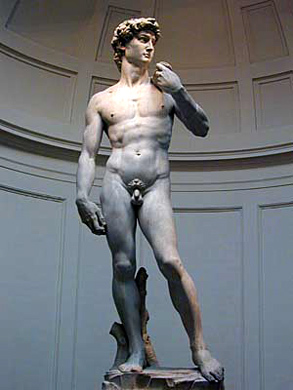 A product that achieves design excellence has a perfect marriage between art and science (50%-50%). The challenge is that it is very difficult to achieve this perfect harmony. Any real designer will tell you that at the end of the day design science is more important than design art. Science by definition is the pursuit of truth. Art by definition as Ansel Adams pointed out is the pursuit of emotional response. Magna Est Veritas is Latin. Translated into English it means Truth is Great. As the great Toa Te Ching teaches us, "The paths are many but the way is one." As a designer I believe this to be true with design. Ultimately design is about the pursuit of truth. Our founding father and designer Benjamin Franklin was very much aware of this and commonly referred to it as universal or self evident truth. Universal Design is a concept that was first developed by architects, product designers, engineers and environmental design researchers, as a design process for creating products that are geared toward people who have severe physical handicaps. When you are designing for people with handicaps like individuals who rely on a wheelchair for transportation, you have to be very, very careful. One of the cardinal rules of Universal Design is that you must Eliminate Unnecessary Complexity. Universal Design is a system that promotes the development of products that are highly intuitive and equitable. In the end it is all about quality: Quality of design; quality of thought; quality of materials; quality of construction; quality of planning; quality of execution...quality of life. Vince Lombardi put it best when he said, "The quality of a person's life is in direct proportion to their commitment to excellence, regardless of their chosen field of endeavor." Ancient Greek philosopher Aristotle, summed it up perfectly when he said, "We are what we repeatedly do, excellence therefore is not an act—but a habit." I am so passionate about great design that I have dedicated my life's work to the understanding and development of design excellence. I hope you enjoyed learning about my design philosophy. On a closing note I will let you know, I have very simple taste. I simply like the best of everything. And always remember, design is the supreme art. —Jake Ehrlich III, San Francisco, California U.S.A.
© 1999-2005 Jake Ehrlich. All rights reserved.